Karl Schmidt-Rottluff (1 December 1884 – 10 August 1976) was a German expressionist painter and printmaker, one of the four founder-members of the artist group Die Brücke. Karl Schmidt Rottluff was born in , Saxony, today a district of Chemnitz, and attended the Humanistisches Gynasium in Chemnitz. He began to study architecture in Dresden, but gave up after a term, when he became a founder member of a group of artists known as Die Brücke ("The Bridge"), along with his fellow architecture students Ernst Ludwig Kirchner, Fritz Bleyl and Erich Heckel. The group was founded in Dresden on 7 June 1905, and its first exhibition opened in Leipzig in November of the same year. In 1906 he added "Rottluff" to his surname. He spent the summer of that year on island of Alsen, in the company of Emil Nolde. From 1907 to 1912 he spent the summers on the coast at Dangast, near Bremen. In December 1911, like the rest of members of Die Brücke he moved from Dresden to Berlin. The group was dissolved in 1913. He served in the army on the eastern front in 1915–18, before returning to Berlin, where he spent the rest of his life, except for a period during the Second World War, when he returned to Rottluff following the destruction of his studio in an air raid. The honours bestowed on Schmidt-Rottluff after World War I, as Expressionism officially recognized in Germany, were taken away from him after the rise to power of the Nazis. He was expelled from the Prussian Academy of Arts in 1933, two years after his admission. In 1937, 608 of Schmidt-Rottluff's paintings were seized from museums by the Nazis and several of them shown in exhibitions of "degenerate art" ("Entartete Kunst"). By 1941 he had been expelled from the painters guild and forbidden to paint. He was a prolific printmaker, with 300 woodcuts, 105 lithographs, 70 etchings, and 78 commercial prints described in Rosa Schapire's Catalogue raisonné. Schmidt-Rottluff's works are included in the collections of, among others, the Museum of Modern Art, New York; the Neue Galerie, New York; the Los Angeles County Museum of Art. 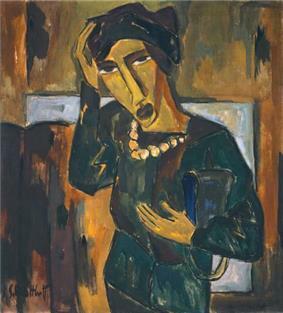 The Museum am Theaterplatz in Chemnitz has a large collection of work from Schmidt-Rottluff. In 2011, the Neue Nationalgalerie returned two paintings by Schmidt-Rottluff, a 1920 self-portrait and a 1910 landscape titled Farm in Dangast, to the heirs of Robert Graetz, a Berlin businessman who was deported by the Nazis to Poland in 1942. A German government panel, led by former constitutional judge Jutta Limbach, had previously ruled that the loss was almost certainly a result of Nazi persecution and the paintings should be returned. Schmidt Rottluff's esteemed Self Portrait with Monocle is now currently in the Staatliche Museum. In 1997, £925,500 was paid for Schmidt-Rottluff's Dangaster Park (1910) at Sotheby's in London.. At a 2001 Phillips de Pury auction, British art dealer James Roundell bought Schmidt-Rottluff's The Reader (1911) for $3.9 million. The top price ever paid at auction for a work by Schmidt-Rottluff was almost $6 million for Akte im Freien – Drei badende Frauen (Outdoor Nudes – Three Bathing Women) (1913) at Christie’s in London in 2008. Letter from Adolf Ziegler about the Nazi seizure of work. ^ a b c d Carey, Frances; Griffiths, Anthony (1984). "Karl Schmidt-Rottluff". The Print in Germany 1880–1933. London: British Museum Publications. p. 123. ^ a b Karl Schmidt-Rottluff Museum of Modern Art, New York. ^ Elizabeth Zach (July 27, 2012), In Germany, an Unlikely Art Hub Honed by Enthusiasm New York Times. ^ Catherine Hickley (November 18, 2011), Berlin Will Return Paintings to Auschwitz Victim’s Heir Bloomberg. ^ Souren Melikian (October 25, 1997), Great Substitution Game Generates High Stakes and Huge Profits International Herald Tribune. ^ Carol Vogel (November 6, 2001), First Art Auction of Season Indicates a Healthy Market New York Times.